The nerd in me geeked out when these came in the mail today. So excited! 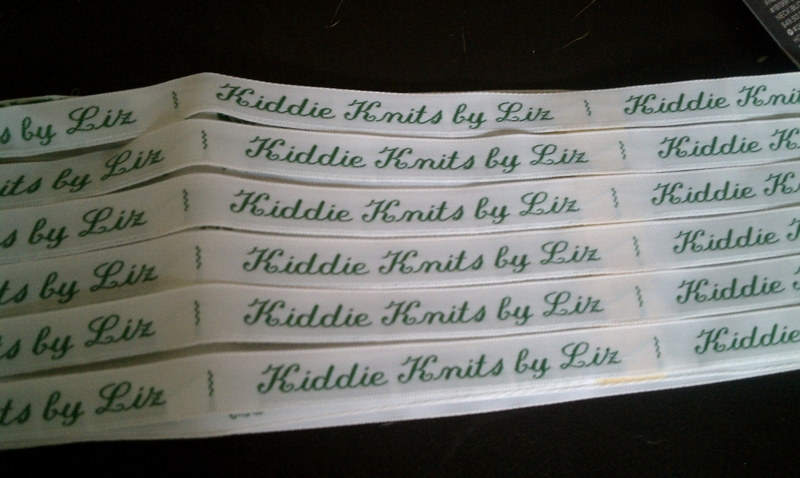 So, 2-3 months ago I ordered clothing labels to sew into my finished knitting projects. The website I bought them from estimated the shipping time to be about 4-6 weeks, but about 3 weeks ago I got an e-mail from the company saying that the factory had messed up the design and had to start over. Bummer, right? Well, this evening when I got home from a very long day at work and an excruciatingly long night class, there was a small, brown envelope mixed in with junk mail, bills, and bank statements. The most recent thing I’ve ordered online was a book from amazon.com, so I knew that wasn’t it. And it had been so long since I ordered the labels, that seeing the package was like Christmas; the only way of solving the mystery was to open the package! Actually, it had been so long since I ordered them, I’d forgotten what was on the labels. “Knits by Elizabeth”? “KnitsbyLiz”? Nope, “Kiddie Knits by Liz.” Which is really great, except that I’ve since branched off to non-kid-related items (next blog post to come). 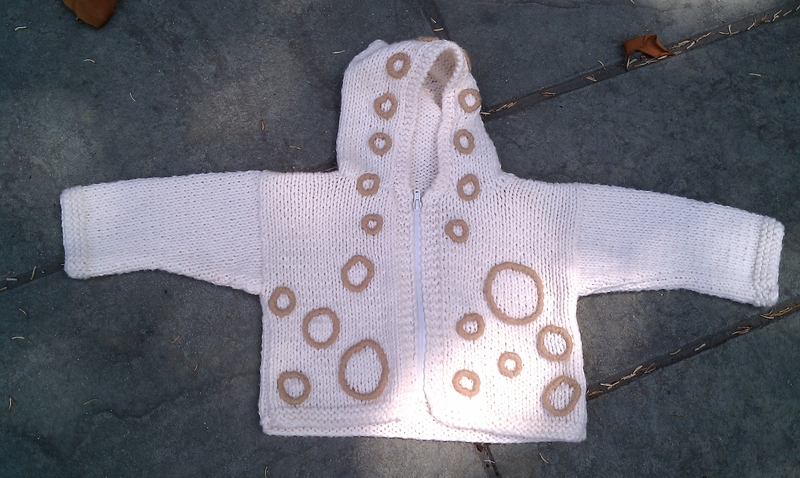 Considering the lengthy list of knitted baby things on my to-do list, though, “Kiddie Knits” will be just fine for now. Short version of this story: I LOVE my new labels! 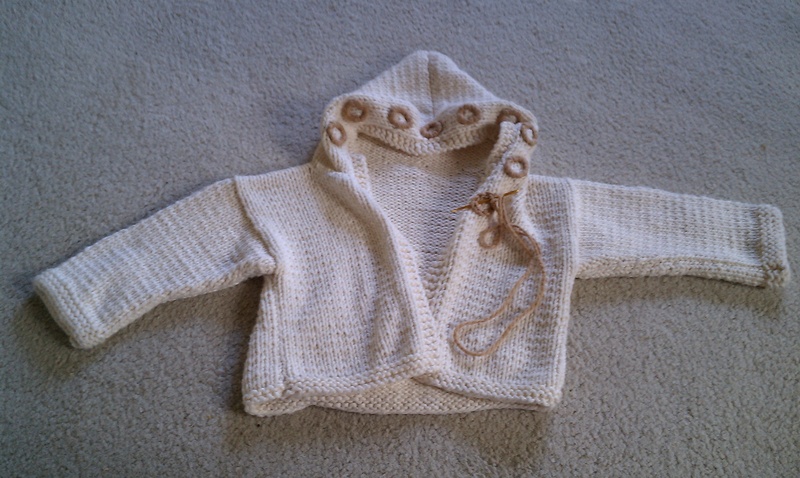 I finally finished the baby hoodie!!!! This was definitely one of those projects that if I had not been making it for someone else I would have put it down to come back to later, with “later” meaning “never.” I re-knit the hood three times, sewed on two different zippers, and took off at least 10 misplaced rings. I’m sure there was more trauma, but I’ve blocked it out of my memory to retain my sanity. Not that I am complaining! Because this particular project was so antagonizing, finishing it was that much more satisfying. We were at war and it won a few battles. I felt like moving forward and leaving in the mistakes; but eventually my sheer desire to produce a piece worthy of heirloom status took over and I unraveled inches of beautiful-but-wrong stitches. The first piece to go wrong was the hood. Once I picked up the stitches from the neck and knitted the first row, I counted the number of stitches. Short by 3. I unraveled and tried again. And again. I am now convinced the pattern is wrong; however, I didn’t know that for sure at the time, and I finished the hood anyway. (Kind of the burying-my-head-in-the-sand tactic, which historically never works in the long run.) By “finished,” I mean I bound it off and sewed it closed. Finis. Next was the edging. I finished the entire outer garter-stitched edge along each side and on the hood, and mastered the kitchener stitch, which I’m not entirely sure I’ll ever be able to do without looking at instructions. So, I’m finally done with the sweater and ready to move on to the appliqués. Or so I thought. Having ignored the strange lump on the left collar while I was sewing on the edging, it was now time to face it: one side of the collar blended smoothly into the edge of the hood, while the other side jetted towards the neck as if to house a button. No amount of “reshaping” was going to fix this one, so I (gasp) unraveled it. This is a family blog so I’ll skip past what happened next. Let’s just say that the mistake was corrected and the next try was a success. The second piece to go wrong were the rings. I was so excited about figuring out how to crochet onto a knitted piece that I forgot to look at the pattern for placement of the rings. I put rings of all sizes on the hood, and it was gorgeous! It seemed a little heavy for a one-year-old, though, and I got a sneaking suspicion that the author had not intended for that many rings to go on the hood. Turns out I was right. I unraveled all the rings and started over, this time looking at the picture. The third (and, hopefully) final piece to go wrong was the zipper. The pattern called for an 8″ zipper, so I went to a fabric store. I went to the zipper rack in the middle of the store and was surprised at the seeming lack of selection: there were 7″ zippers and 9″ zippers, but no 8″ zippers. Settling yet again, I went with the 7″ zipper. I figured that in the zipper world it was better to have too little than too much. Like Cinderella’s glass slipper on one of the ugly step-sisters, it was an almost perfect fit. At a friend’s house that night, I carefully sewed on the zipper. The color matched the yarn perfectly, and–to my amazement–the sewing job looked terrific. I was so proud because the only thing I’d ever sewn onto a handknit piece was a button, which really is almost fool proof. Upon completion, I showed my friends the finished piece and slowly demonstrated that the zipper not only looked great, but was also functional. I carefully and methodically grazed the handle down the teeth, making sure not to snag any of the yarn. When I got toward the bottom of the jacket, though, I got a sinking feeling; and at the end, the zipper handle just stopped. Now, it’s been my experience that when the zipper handle on a jacket reaches the bottom of the jacket, it’s supposed to release the two sides of the jacket. Come to find out (thanks to my friend’s love of all things Google), I had purchased–and sewn on–a pants/skirt/pocket zipper. I’ll admit that I actually considered for a moment presenting it to the buyer as a pullover that zips. As if a one-year-old isn’t difficult enough to dress. Ugh. With a seam ripper in hand, I removed the zipper. I had been so close to getting rid of finishing this project. Turns out that the only way to get a jacket zipper in Richmond, VA, is to purchase one online. Basically, it’s a zipper for doll clothes, which I think is hysterical! The good news? It’s 8 inches! Catastrophes aside, I truly love this finished piece, and would make another in a heartbeat since I (usually) learn from my knitting mistakes. The finished product and sense of victory are well worth the struggles and frustrations. Here are some pictures of the heavenly sweater from hell! 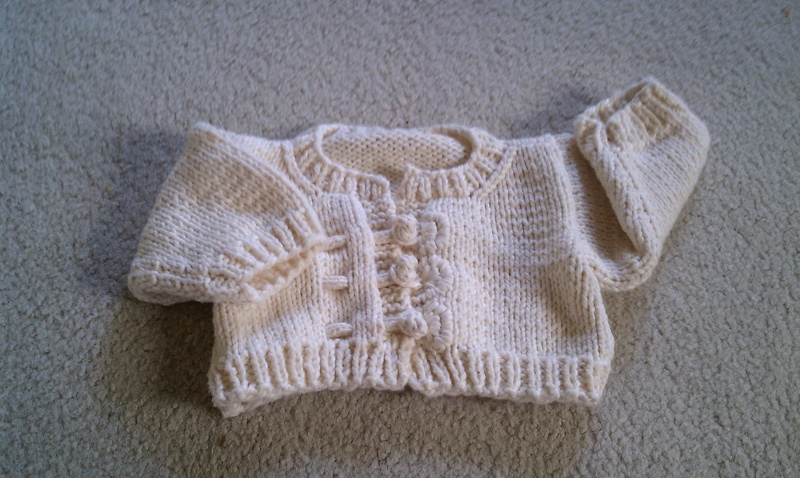 I made my first baby sweater two years ago as soon as my sister and her husband announced they were expecting. As in, they surprised me at dinner on a Friday night, and that Saturday morning I ran to the yarn store, bought tons of books and yarn, and started knitting frantically. I had most of the sweater finished nearly a week later, with just 7.5 months to spare. Talk about a close call! 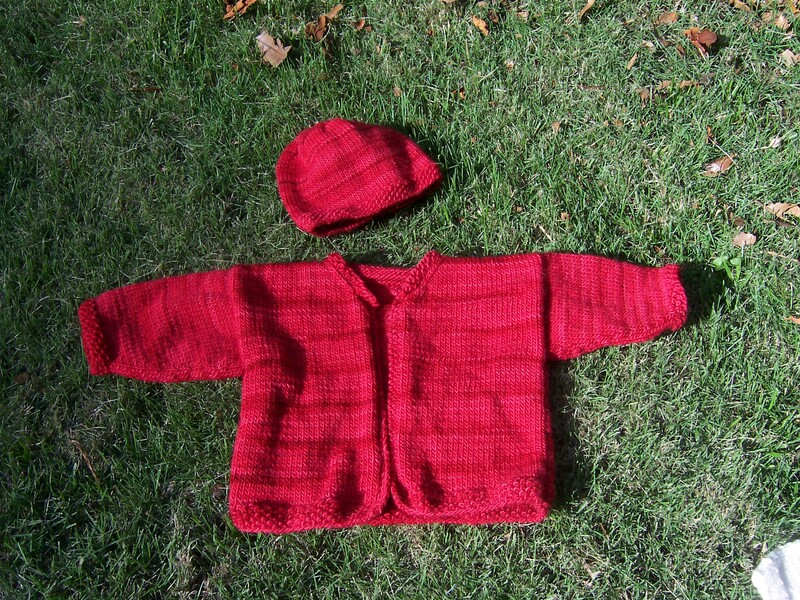 My intention was to present my sister with the sweater set at the baby shower, which was half a year away, but I was way too excited about it to pack it away for the next six months. So I took it to work. In fact, I showed off my teeny creation to everybody but my sister and my brother-in-law. The ladies at work went wild, which surprised me a little, since I thought it was far from perfect. 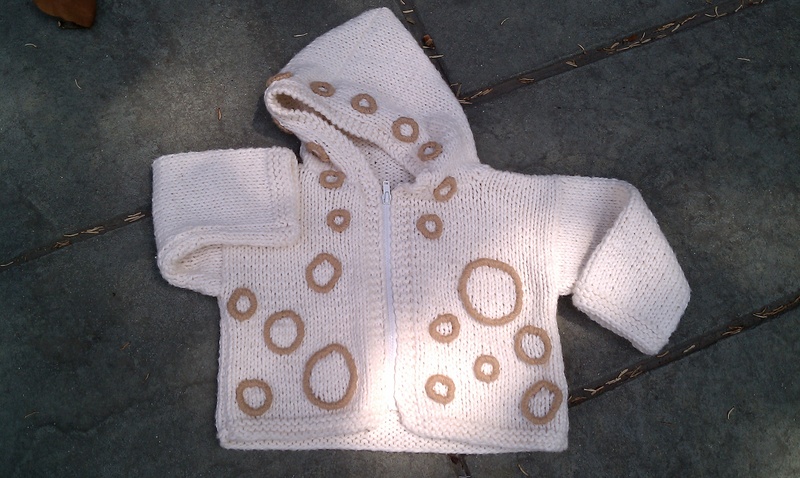 Before I knew it, I had orders for five baby sweaters and a baby blanket–all from those books that I had rushed out and bought impulsively. The toggle buttons really make it, I think! As I alluded to in “Turns Out I Like Purple,” I suffer from self-diagnosed Knitters Attention Deficit Disorder. (Perhaps I’ve found my dissertation topic for when I pursue my doctorate in counseling.) The smaller the project, the more likely I am to complete it–I am a true American stereotype and I prefer instant gratification. I even prefer acrylic paint to oil because it dries almost instantly. Oil paint can take up to a week to fully dry to the point of being able to paint over it. Lenghty projects are just not my style when other, newer projects arise. That’s why baby knits, save blankets, are my thing. The only feeling in knitting that is as exhilirating as beginning a new project is finishing one, and baby knits give me that wonderful sense of accomplishment. It doesn’t hurt that they’re super cute, either. Finished base sweater, ready for appliques. This is one of my favorite sweaters when finished. It is going to have a knitted white daisy sewn onto a front panel and another onto the hat. A green stem will wind down the center of the cardigan and serve as button loops. The green stem on the hat will end at the top in a pom-pom. Additional pictures to be posted once finished. Almost finished! 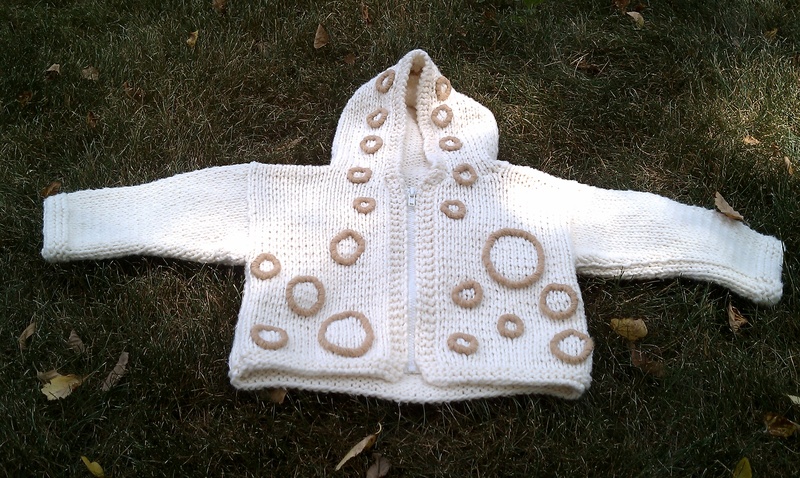 I will be so glad when this sweater is finished and in the hands of the woman who ordered it. I've had to take it apart so many times to redo different sections, and I'm grateful the yarn has held up so well. I have a feeling I'll have to do a whole separate post just for this piece. There’s something exciting about beginning a new project: finding a trendy pattern that isn’t reminiscent of the 1960s, discovering the perfectly vibrant yarn that feels like heaven, and casting on the first row of stitches. Beginning new pieces is so enticing that I have a tendency to start more projects than I have time to finish, and when I’m making something for myself, months can pass between stitches. This is well illustrated by my stashes of balls of yarn pierced with needles waiving colorful, non-identifiable swatches. I always finish the pieces I make for others, so therein lies my motivation. The guilt of not completing a commissioned piece is simply stronger than my yearning to start on the next one. There are times when the stars align and I finish a project for myself, and below are some of my favorite pieces. I didn’t realize it at the time, but it turns out that my favorite yarn color is purple! Be sure to click on the pictures for more information about the pieces. I’m a legal assistant by day, a counselor education graduate student by night, and a knitter at heart. I’m creating this blog so I can have a forum to write about my knitting successes and, well, faux pas. My grandmother taught me to knit when I was seven years old, and I’ve been knitting ever since. 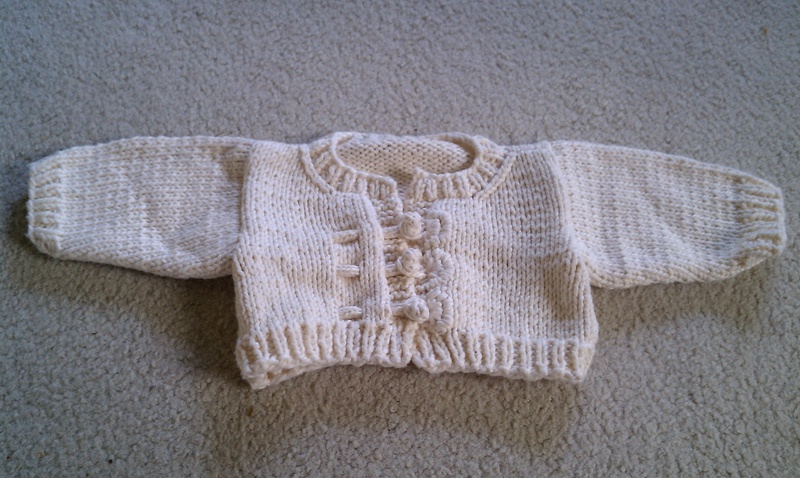 A couple of years ago, I brought a baby sweater to work to show off to my coworkers what I made for my soon-to-be niece. I’ve had a steady flow of requests ever since. What I’ve learned most from knitting is that there is always more to learn. Whether it’s knitting with beads or sewing in a zipper, knitting is analagous to life: I venture down a new path, catch a few snags along the way, feel as though it can all unravel at any moment, but then I come out on the other side with a masterpiece that is often completely different from what I pictured; it’s better. Hoods and Zippers and Rings, Oh My!